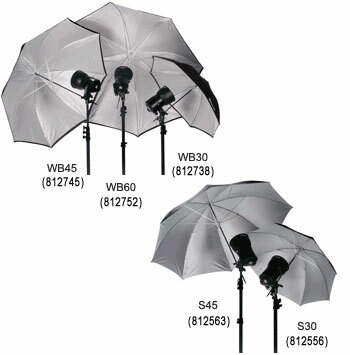 Umbrella lighting is a simple, inexpensive and portable solution to the need for controlled, diffused bounce lighting. Available in 30", 45" and 60" sizes, Norman white umbrellas can be used in all types of lighting situations, including portrait, group and commercial, as well as being a good tool for flood lighting large areas. All umbrellas can be mounted on Norman monolight and lamphead stand adapters. The Norman 30" and 45" silver umbrellas feature a neutral fabric that provides a little more contrast than the white umbrellas. They are a good choice when the job requires improved color saturation, specular highlights and texture. Compact and portable, these umbrellas are a good fit in the studio as well as on location. For the most efficient use of umbrella lighting, use reflectors designed for that application, like the 5DL, 7H or 2Q models. All Norman white umbrellas have a removable black backing. The exposed white translucent material makes an excellent soft portrait when aimed at the subject to shoot through, as a direct diffused light source.